Paul Levy, prominent blogger and former president and CEO of Beth Israel Deaconess Medical Center in Boston, is calling for some disciplinary action at a Chicago-based hospital over its ad for da Vinci robots. In the latest post for his blog "Not Running a Hospital," Mr. Levy identifies several problems with an ad the University of Illinois Hospital & Health Sciences System ran in the New York Times Magazine last weekend. 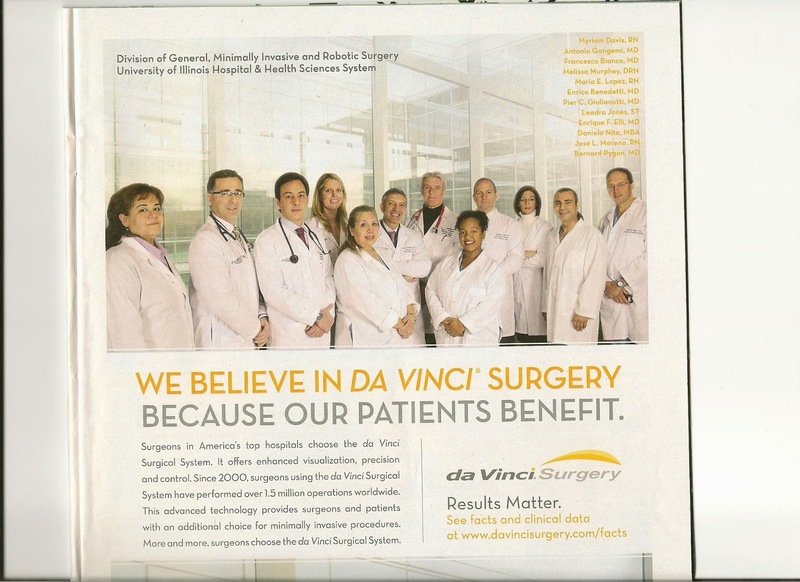 The ad features 12 people dressed in lab coats with the large tagline, "We believe in da Vinci surgery because our patients benefit." The ad includes a copyright mark held by Intuitive Surgical, the robot manufacturer. The bottom portion of the ad also includes a disclosure that some surgeons who appear in the ad received compensation from the company for providing educational services to other surgeons and patients. "Whose ad is this?" wrote Mr. Levy. "If it is an ad paid for by the University of Illinois, why doesn't the University hold the copyright? If the ad is paid for by Intuitive Surgical, Inc., how can the University allow its name to be used for commercial purposes?" Mr. Levy then identifies four ways in which the hospital violated its own Code of Conduct — which he includes in the post — through the ad. He says the university allowed its reputation to be used in a nationally distributed advertisement produced and owned by a private party, which is not consistent with its code to exercise custodial responsibility for the university property and resources. He also takes issue with the fact that there is no disclosure as to which surgeons have been compensated by Intuitive Surgical and the amount of money involved. "So, who should be fired for these violations? Simple: I would choose the highest-rank administrator and clinician who gave permission for this advertisement to be published," wrote Mr. Levy. Note: An earlier version of this report mistakenly said the copyright mark was only for the words "da Vinci." Da Vinci Robots: Minimally Invasive Miracle or Costly Conundrum?